When I was at uni I was something of a drunken sot, but since leaving I rarely drink if at all, apart from two exceptions; Eggnog and Mulled Wine. I know a lot of people don't like Eggnog because of the raw egg element, and it's not a traditional or popular a drink in the UK as it is in the US. If eggnog isn't your thing, you can't go wrong with mulled wine, there's something about warmed wine that has an almost sedative like quality, I've missed many a Christmas day film after a glass or two of the mulled stuff only to wake up during the closing credits. You can buy bottles of ready made mulled wine, which I think are overpriced (depending on where you get them from, Sainsbury's do a reasonably priced bottle) but in the spirit of all things homemade I thought I'd post my recipe for homemade mulled wine. If like me, normal red wine makes your mouth pucker a bit then this recipe is a winner because you can add more or less of the basic ingredients to cater to your own tastes. 1 Bottle of red wine (doesn't have to be particularly expensive, I'm not an expert on wines, so I would suggest just buy something that's not stupidly cheap or wildly pricey). Throw the whole lot in a big saucepan and heat through until the mixture almost comes to the boil (do not boil it!). Give it a good stir and strain the mulled mixture to get rid of the orange and cinnamon etc. Keep the strained mulled wine over a low heat to keep it warm. 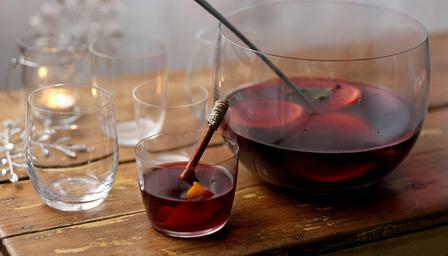 Ladle into mulled wine glasses (if your posh), tumblers if your not. enjoy with a mince pie and try not to gulp the whole lot down yourself, I wouldn't like to think I'm responsible for anyone being reckless while under the influence of mulled wine so drink responsibly my lovelies and not on an empty stomach! Picture is unfortunately not one of my own, but from the BBC food site.